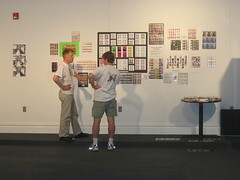 The 7th International Photobooth Convention was held at the Mad Art Gallery in St. Louis, Missouri. 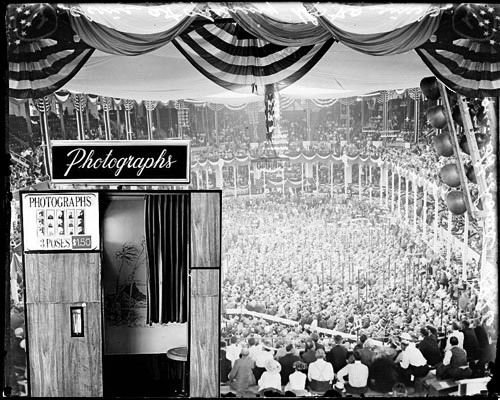 Photobooth artists and enthusiasts from the UK, around the United States, and the St. Louis area took part in the two-day event. 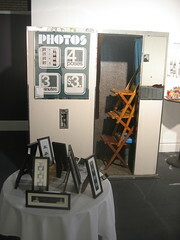 Two vintage black and white photobooths were open and free for use, as were two digital booths: a new "hairstyle" booth as well as a unique 'retro-digital' booth that combines the exterior of a classic black and white booth with a new digital camera and high-quality color printer. More than 200 participants joined in the fun, taking photobooth pictures and collaborating on a group project in which every participant took a strip of four photos inspired by four emotions: happiness, sadness, surprise, and anger. 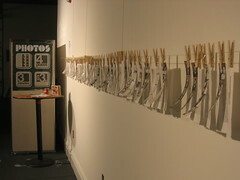 The results of this project will be collected and displayed soon. Two new multi-player photobooth games were also invented during the course of the convention; we'll be setting down the rules and hoping these games will spread to other lands. Photobooth artists Steve 'Mr Mixup' Howard and Nakki Goranin displayed some of their work, and Brian Meacham delivered a talk entitled "Photobooths in Cinema: A Descriptive History," followed by a screening of Jean-Pierre Jeunet's Amélie. Tim Garrett opened up one of his photobooths and gave a talk and demonstration that explained the way a traditional 'dip and dunk' photobooth works. Read the Photobooth.net Blog wrap-up entry. Brian's Flickr photostream with photos of the days' events.